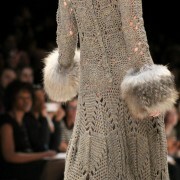 And to finish for today I leave here some crochet wool dresses from “LINE Knitwear” from the collection of 2012. They are the most beautiful winter dresses that I’ve seen in my life. Well, for today it’s all. Kisses! See you tomorrow! Hi everyone! Continuing with knitted fall fashion. New dress from SexyCrochet made ​​of warm dark green wool. A great model for this fall/winter. The strict dress fits perfectly for a buisnes lady or student. The dress knitted with soft and warm wool 50% merino 50% acrylic. You can buy it in my shop on Etsy. We prepare for fall. Wool dress. White crochet long dress. Peris Hilton. Beautiful white crochet long dress. (model Peris Hilton).